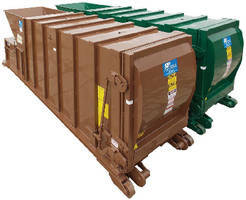 Self-Contained Compactors suit limited space applications. Designed as integral compactor, power unit, and container, SCM Series provides safe and sanitary handling of general waste. Single-cylinder commercial units come inÂ 10 frame sizes with capacities from 7–23 ydÂ³. When full, entire unit is loaded on roll-off hoist truck for transport to disposal site. Units come standard with 5 ft wide rectangular container for space savings, but 6, 7, and 8 ft models are also available. All offer 28 x 46.5Â in.Â clear top opening and max packing force of 26,400 lb. HOPKINS, MI – SP Industries introduces the Mini Self-Contained Commercial Compactor System. The SCM Series of Self-Contained Compactors are designed specifically for applications with limited floor space to fit traditionally sized systems. The SCM Series is designed as an integral compactor, power unit and container. When full, the entire unit is loaded on a roll-off hoist truck for transport to a disposal site for emptying. It features a single cylinder compactor design in 10 frame sizes that provide capacity capabilities of 7 to 23 cubic yards. With a standard 5-foot wide rectangular container, these machines save space in tight alleyways and crowded loading docks. Sizes of six, seven and eight foot containers are also available. All models offer a 28" x 46.5" clear top opening and a maximum packing force of 26,400 lbs. Most under structure styles can be matched allowing compatibility with nearly all roll-off hoist trucks. SP Industries was established as a manufacturing facility in 1957, initially operating as Quality Steel Fabrication. As the name implies, the company specialized in custom fabrication, working with such companies as Caterpillar Tractor, GMC, Excello Corp. and Lockheed Manufacturing, among many others. The company also built compactor rams and frames for Spartan Waste-Pac, the original designer, patentee and manufacturer of refuse reduction equipment. After several changes in ownership, the key long-term employees created a new company, SP Industries Inc., that has maintained its position as the leading waste handling equipment manufacturer in the world. The company specializes in waste handling compaction and dumper systems tailored to the specific requirements of diverse industral and commercial applications.